From time to time, I remember a certain event from my childhood, an event that filled me with terror. I was four years old and riding my bike with my brother and a couple of friends. We had just gone around the corner where a dog would always bark from a garage. We had learned that this dog barked every time we rode by. On this day as we rode our bikes I was in the back of the group. The dog, a Doberman Pincher busted through the garage door and started giving chase. I was the youngest and the slowest of the group. In my mind I was suddenly the young wildebeest being pursued by a hungry lion. I was peddling as fast as I could, but I had no hope of getting away. I could hear the barks as they got closer and closer. I heard the teeth snap as he bit at me once, then twice, then it happened I was yanked off my bike as the dog caught the back of my shirt. I knew I was going to die. Of course I didn’t die, in fact the only injury I sustained was a busted elbow from hitting the sidewalk. The dog stood over me, barked for a few minutes, and then went home. From that moment on I was terrified to go around that corner. Terror can have profound effects on a person. It can trigger a flight or fight reaction. It can cause people to become paralyzed, it can trigger panic attacks, and it can affect you for your entire life. But not all terror is a bad thing. Sometimes a terror response or fear response can be the difference between life or death; a quick reaction, running away, or maybe just a change in how we think. The Bible tells us that, “The fear of the Lord is the beginning of knowledge, but fools despise wisdom and instruction.” (Proverbs 1:7) and also that “The fear of the Lord is a fountain of life, turning a person from the snares of death.” (Proverbs 14:27). In these passages I have heard the word fear down played time and time again. People will interpret this as saying fear means reverence, awe, and respect, and that God doesn’t want you to be afraid. Sure, this sounds good, but it doesn’t add up in the original language. 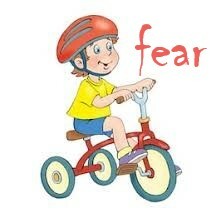 In the original text this word fear means terror. The word that means reverence, awe, and respect is often translated to honor, such as, “Honor your father and your mother, so that you may live long in the land the Lord your God is giving you.” (Exodus 20:12). In fact, the idea of fearing God appears around 490 times in the Bible. Why? Why should we fear God? Why should He terrify us? I remember one day as a young kid I got in trouble at school – and I mean serious trouble. I got paddled by the principle and he called my dad. The rest of the day my mind was focused on one truth: when I get home, I must face dad. It was a day of sheer terror. The bus ride was horrible, every stop was one stop closer my destination. The walk from the bus stop to my front door was the longest 6 houses I ever passed. I was a dead man walking. If as a child I feared my dad, how much more should I fear God, especially when I willingly make a mockery of His holiness? This is what we do when we sin. We commit a grievous offence against the person and character of God. We were created to bear His image, reflect His glory, and display His goodness. The fear of God is a terrifying understanding that when we stand before an eternal righteous God our every offense is against the author of our lives. Now don’t misunderstand me, this terror is a starting point, Proverbs 1:7 calls it the beginning of knowledge. This knowledge opens our eyes to see the desperate situation we are in. God is Holy! He is Righteous! God is just! He is the author of what is good, what is moral, and what is true. Our sins are more than being disobedient, they are an assault against the very nature God – the nature we were created to reflect before all creation. Therefore, even the smallest offence is an eternal offense. Understanding this truth lets us know that we deserve eternal punishment for our sin, we deserve the wrath of God. This is the fear of God. WE DESERVE THE WRATH OF THE ALL POWERFUL, ETERNAL GOD! When we have the fear of God, we can finally understand the beauty of the Gospel. The fear of God is where understanding starts and the glory and grace of God is realized in the Gospel. For we cannot fully understand the power of the Gospel until we understand who we are in relation to the holiness of God. You see, in my wickedness, I sinned against the Holy One, the Righteous One, the Eternal One, the All Powerful One, the All Knowing One; I have sinned against the very character and nature of God and I deserve His eternal wrath. It is no wonder Paul told the Philippians to “continue to work out your salvation with fear and trembling, for it is God who works in you to will and to act in order to fulfill his good purpose.” (Philippians 2:12b-13). It is in the fear of God that I realize the desperate situation I am in. I need a savior! I need someone to step in and pay my debt to God. The problem is that everyone else is in the same situation that I am in. They too have earned the wrath of God. Jesus died so that I could be reconciled with God. This is good news! In Jesus I will no longer receive the wrath of God! In Jesus I am free to know God, to love God, and to glorify God. My hope today is that you may know the fear of God that leads you to the grace of the Gospel. Jesus loves you and while you were His enemy, He died for you!